As state support for higher education has eroded, North Carolina students and families have shouldered more and more of the cost of a post-secondary education. A new report by the Center on Budget and Policy Priorities highlights how years of reduced investment by North Carolina in higher education has helped drive up tuition at public colleges, jeopardizing the ability of many students and families to afford an education that is key to their long-term financial success and essential to a growing economy. State support for higher education remains well below the 2007-08 school year — 20.1 percent when adjusted for inflation, the report notes. Amid an improving national and state economy, state lawmakers have chosen tax cuts over restoring and boosting investment in higher education. These tax cuts have significantly reduced revenue that otherwise would be available to make a college education more affordable. Revenue loss will top more than $2 billion each year once all tax changes passed since 2013 are fully in place. State and local dollars make up a significant portion of public colleges and universities budget. As such, large cuts in state funding for public universities in recent years have resulted in a steady increase in tuition. 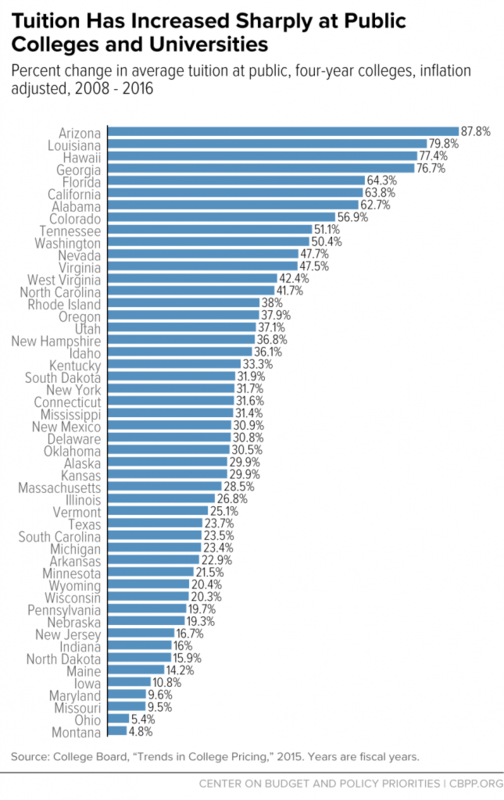 North Carolina is among the top of states for the percent increase in tuition at public four year colleges since 2008. Average tuition at four-year public colleges in North Carolina is up by $2,051, or nearly 42 percent, since the 2007-08 school year, among the highest increases in the nation. Meanwhile, federal and state financial aid for the average student has not kept up with the rising costs of earning a college degree, the report found. Affordable higher education becomes even more important as wages and income for low- and middle income families have declined or stagnated over time. Rapidly rising tuition at a time of weak or declining income growth has damaging consequences for families, students, and the state economy because higher tuition jeopardizes the ability of many to afford the college education that is key to their longterm well-being. This problem is especially significant for low-income students and students of color, and hurts campus diversity in public colleges. Getting a college degree is increasingly important for professional success and entry into the middle class or beyond. A large and growing share of future jobs will require workers to have some type of post-secondary credential. Furthermore, communities benefit when more residents have college degrees. Areas with highly educated residents attract employers who pay higher wages. Those employees, in turn, use their wages to buy goods and services from others in the community, boosting the area’s economy so the wages of workers of all levels of education are higher, according to the report. State leaders must make a greater commitment to ensure high-quality and affordable postsecondary education opportunities are available for North Carolina students. A heightened commitment would ensure that cost is not a barrier to opportunity, promote college completion and reduce the need for students and families to take on student loan debt that can hinder economic mobility.